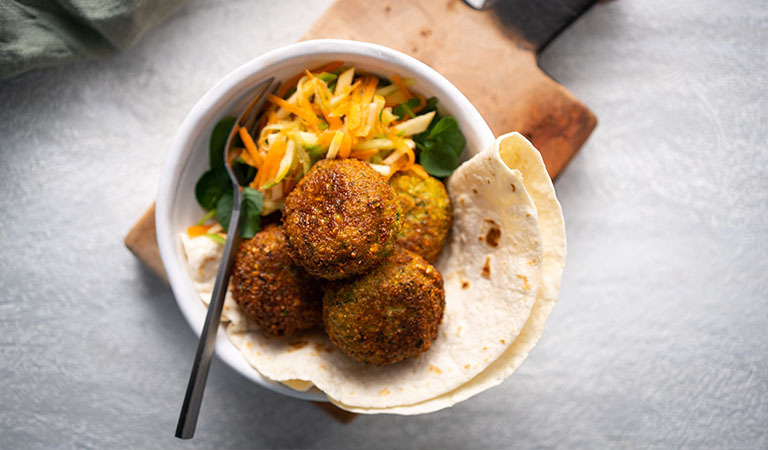 Nutritious and bursting with classic middle eastern flavours, these healthy falafels are made with fresh herbs, spices and protein-rich chickpeas – a great source of vitamins, minerals and fibre. 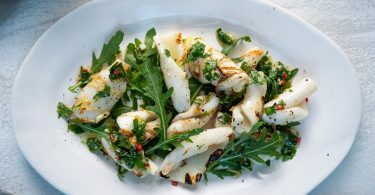 The fresh salad adds a lovely crunchy contrasting texture. Roughly chop the onion, garlic, chilli and herbs and put them into a food processor, pulse a few times, then add the chickpeas and blitz until everything becomes a thick paste with small, even-sized bits. The best way to check whether it is done is to scoop up a small amount and squeeze it together in your palm – it should hold its shape. Tip the mixture into a large bowl, add the spices, salt, flour and baking powder and mix until combined well. 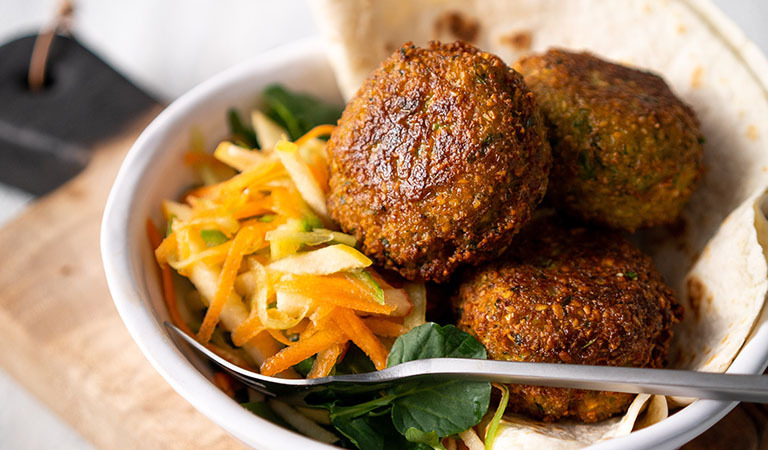 You can shape the falafel mix in a few different ways: Use damp hands and make little balls or torpedo shapes or you can simply drop in spoonfuls of the mixture for free-form falafel. You want to be making them about the size of a walnut, no bigger, so that they cook through and crisp up at the same time. Pop some olive oil in a non-stick frying pan and let it heat up. Carefully place the falafel in the pan – don’t overcrowd the pan and fry until the exterior is browned and crisped (about 2-3 minutes). Remove to a plate covered with a paper towel to absorb the excess oil and repeat the process until you have fried them all.